Here at Full-Time Job From Home, I’m all about finding you scam free online jobs. Below you will find a list of all the sites that are completely scam-free and can help you make money online. There are a few different categories listed below like survey sites, paid to search, shop, visit, and listen. All of the sites listed below are great options for you to make some extra money online. Although I recommend using all these sites, I have marked a few below as Recommended just because these are the best of the best and I think everyone should take advantage of them no matter what you’re making money online goals are. Please understand that all of these opportunities are supplemental income opportunities. These are designed to help you earn an extra $20-$100 a month. Most likely unless you work hard, you won’t make more a month than that, but if you combine a few of these opportunities, you can build a solid income online. This list of sites is catered to US readers; some international visitors might not be able to take advantage of some of these sites. 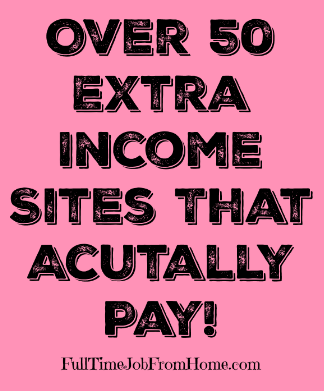 If you’re struggling on this list, head over to the top extra income sites open worldwide! Before you get started one last thing. I said these opportunities are supplemental income. If you’re looking to make more money online than just a few hundred bucks and want to start your very own online business, visit the link below to learn more. It’s how I make money online and how I make 95% of my online income. If you’re interested in making a full-time online income, check out My #1 Recommendation, it’s how I made over $13,000 online last month! List of All Legit Online Jobs! Within this category, you will get paid to take online surveys. These sites are the top rated survey sites out there that I get paid by each and every month. You can see the ranking I gave the company next to its name. Along with taking surveys, a lot of these companies also let you earn money different ways like completing offers, watching videos, and completing tasks. Swagbucks 96 Out of 100 (Full Review Here) Now Offers $5 Sign Up Bonus! Fusion Cash 94 Out of 100 (Full Review Here) Now Offers $5 Sign Up Bonus! This is one of my favorite categories, and I think everyone should join both of these sites. How awesome is it to get paid to search the internet. You do it every single time you get on the web so why not get paid for it. Both of these sites are great, and I recommend all of them. One of the best ways to make some extra income online is by watching videos. There’re a few good sites that will let you watch videos for cash, but here’s my favorite. Fusion Cash 94 out of 100 (Full Review) Now Offers $5 Sign Up Bonus! Swagbucks 96 out of 100 (Full Review) Now Offers $5 Sign Up Bonus! In this category, you will see scam free sites that will pay you cash back for shopping online. Even if you don’t think making money online is right for you, these opportunities are perfect for anyone. Most people shop online these days so why not get paid cash back on your purchases. I recommend all three of these companies, but I think Ebates is one of the best because it offers cash back at Amazon! Ebates (Recommended) 95 Out Of 100 (Full Review Here) Now Offers $10 Sign Up Bonus! Ibotta (Recommended) 95 Out Of 100 (mobile app only in-store shopping only) (Full Review) Now Offers $10 Sign Up Bonus! Dosh (Recommended) 95 Out Of 100 (in-store shopping, online shopping, hotel booking cash back) (Full Review) Now Offers $5 Sign-Up Bonus! In this category, you’ll find awesome ways to make a passive income online. Please note that these sites either track browsing history or app usage, but it’s an easy way to make money! In this category, you will get paid to open emails. Now this won’t make you a ton of money, but it does offer a unique way to make money online. Luckily both of the companies below offer other ways to earn like surveys, offers, watching videos, and much more. This is awesome because it means you can earn more each month! In this category, you will get paid to visit websites. This is a unique opportunity and the site listed below is one of the very best companies for viewing websites. I highly recommend ClixSense. I review a ton of Smartphone Apps that can make you money to see them all you can look at this list. A lot of the apps on the list are location-based, but below I’ve listed the sites that I highly recommend that you can use anywhere at anytime! One of my favorite ways to make money online is through listening to music. Below are sites that actually will pay you to review music and listen to music. Did you know that you could get paid to lose weight? One site I listed below will pay you money if you meet your weight loss goals! Did you know you could get paid to teach English to students around the world? Here’re two options you can use to make up to $21 teaching English at home. Almost all of us purchase gas for our vehicle so you might as well earn some cash when you do. Below are a few options to earn cash back when you buy gas! You can actually get paid to play games online and on your phone! You’ll earn points while playing and can cash out via PayPal or gift cards! These sites will pay you Bitcoin to take surveys, watch videos, complete offers, and more! They pay directly to your Bitcoin Wallet. Most of us are familiar with companies like Uber but did you know you can set your own schedule and you don’t even need your own vehicle! If you have extra room in your house you could be making an extra income each month renting your stuff! Some sites will pay you to test products. All of these sites are completely free to join and will send you products in the mail to try and review. Some pay you cash for your reviews, and some just let you keep the full-size products as a reward. Either way who doesn’t like Free Stuff. These sites will pay you to share links on social media. These sites pay on a pay per click basis and show you how much you will get paid per click. Personally, I’m not a huge fan of making money this way because it’s usually just a few extra bucks a month and it’s harder then most people expect. But if it sounds like something you’re into these sites are scam free. Usability Testing (All Usability Testing Sites): Usability Testing Sites pay you to complete short 20 minute tests, in these test you’ll visit a companies website and complete tasks such as adding items to your shopping cart. Provide feedback on the site and get paid $10+ for your time. Mock Jury (All Mock Jury Sites): Mock Jury Sites pay you to be a juror in a mock trial. You’ll be presented with a case, review the information, make a verdict, and provide some additional information. Get paid $10+ for your time. All of the jobs listed above are completely scam-free and legit. I recommend that you take advantage of as many as you can because they are an excellent way to make money online. Like I said at the beginning of this article they are supplemental income opportunities that should be combined with others to make a solid income online. After you join a few of the companies above you should also check out how to start your very own business online. It’s how I make my online income and really is the best way to make a large income online. Thanks for reading and I hope you take advantage of some of the great opportunities listed above.